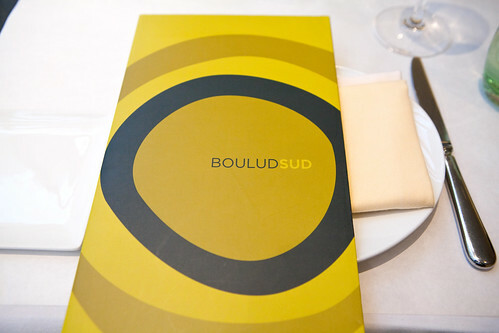 Last week I went to lunch at Boulud Sud with my mother. 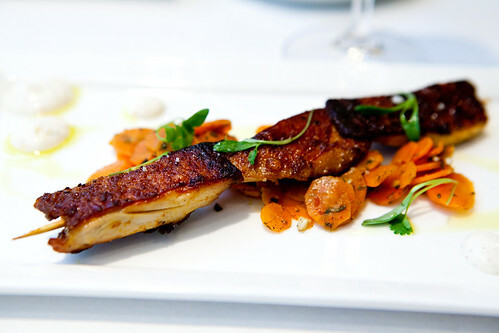 I recalled enjoying their octopus a la plancha dish at StarChefs Gala last October and I’ve kept a mental bookmark to visit one day – which was last Friday. 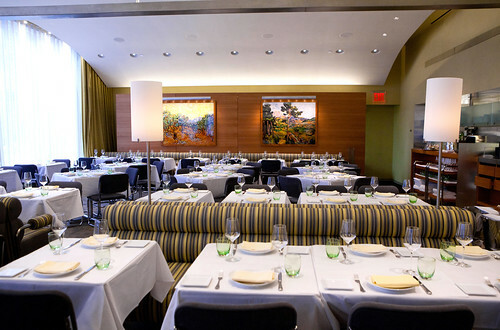 I ended up choosing Boulud Sud as our lunch spot because it’s closer to where I work and I’m curious about Chef Boulud’s newest restaurant as a whole. It feels inviting, sunny and warm here from the use of wood, yellow-beige tones, and the two large, colorful paintings toward the back of room. 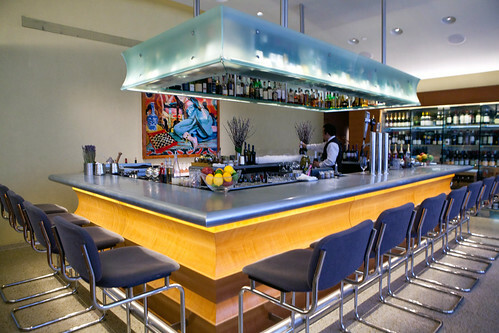 The bar and dining room was essentially one vast open space but divided by the banquettes of the dining room. The dining room was not full when we arrived but as our meal progressed (for nearly two hours), more patrons came in, mostly those of real estate brokering deals to a few out-of-town visitors. 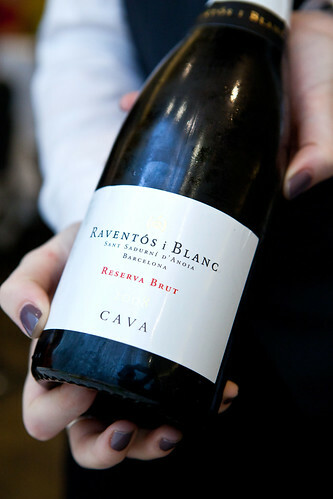 We started off with an apértif Raventós i Blanc, L’Hereu Reserva Brut Cava 2008 ($15 per glass). 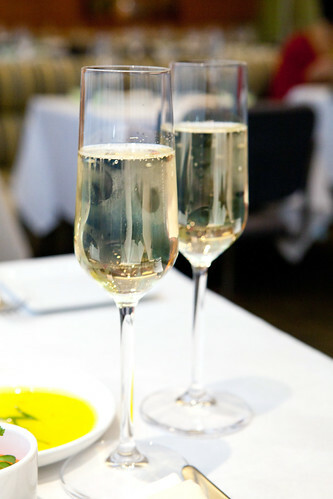 It was smooth, fruity of apples and a hint of lime with refreshing acidity. 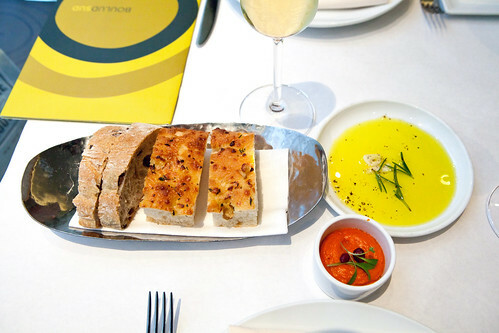 Though the focaccia and olive bread were fine, what really struck me dumbfounded was their spectacular olive oil. I usually don’t go insane, borderline obsessive over any cooking oil but this olive oil was intensely fruity, rich and low in acid. When I asked one of the servers, he mentioned that this olive oil originated from a small olive farm in Southern Spain and their tress are 2,000 years old. You can certainly taste the age in that beautiful olive oil and I’ve half-jokingly said that if Boulud was selling a bottle of that oil at his Épicerie, I’d stop by and buy one. We ordered from the prix fixe ($44 for 3 courses) but added on a few dishes from the a la carte menu, which will be stated accordingly. 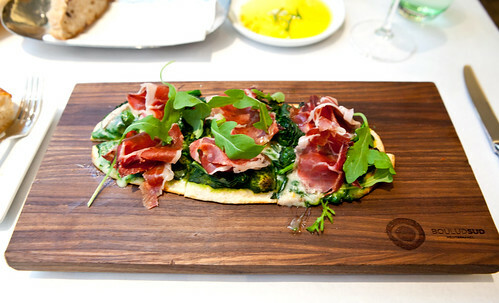 The stone-baked flatbread was a tasty flatbread (that was baked in their brick oven), smeared with broccoli rabe pesto, melted cheese (not sure what but tasted like cow’s milk), prosciutto and arugula. The spiced chicken thigh kabob was moist and had a crisp skin but I found the cumin carrot salad a little more intriguing than the protein. 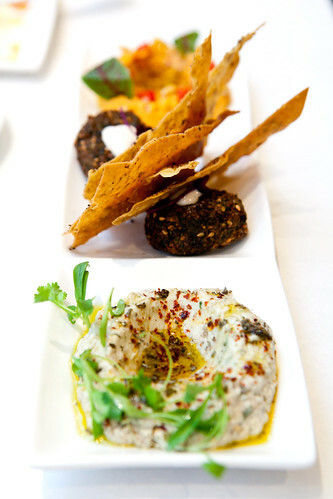 The spread of Chickpea & Eggplant ($15), a trio of dishes of herb falafel and lavash, hummus, and babaganoush. My mother loved the babaganoush for its slightly acidic/citrus flavors. The falafel was quite enjoyable to eat. Crisp yet light and I liked the herbaceous flavor. 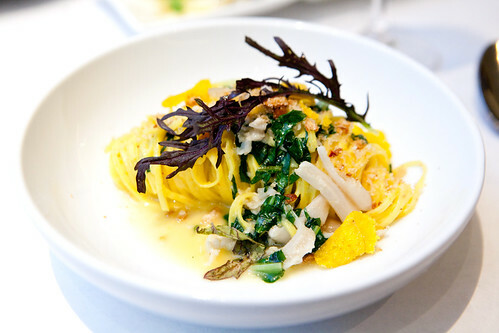 The lemon-saffron linguini ($19) with razor clams, shaved bottarga was delightful. I really adored the use of lemon in this pasta dish and it had a fair amount of razor clams entangled within the pasta. 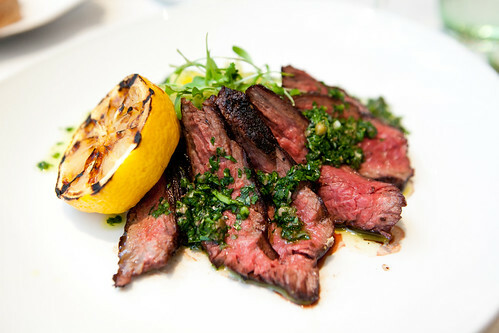 As for our mains, the charred hanger steak with crushed potatoes, salsa verde and grilled lemon was very good and cooked to a perfect medium-rare. 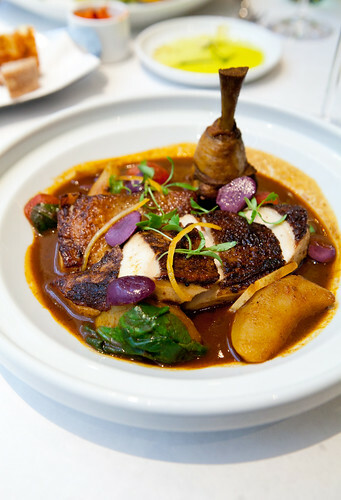 The chicken tagine was simply amazing. I normally don’t order chicken at a restaurant just because I know how to cook chicken but I was craving tagine on that cool, rainy afternoon. The chicken was super moist and tender that it doesn’t require much effort to cut the chicken. 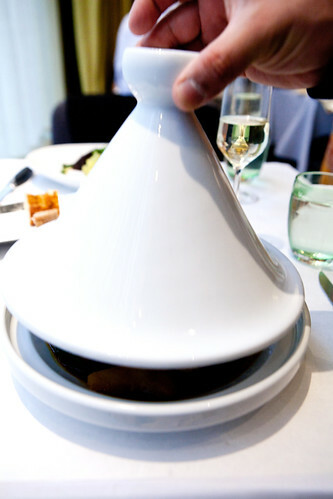 To me, it’s a tagine with some hints of Asian influence. The mention of turnips on the menu was actually daikonn. The sauce was delicious but somehow my mother commented that it tasted like there’s a smidge of Chinese bean sauce when she tried it. 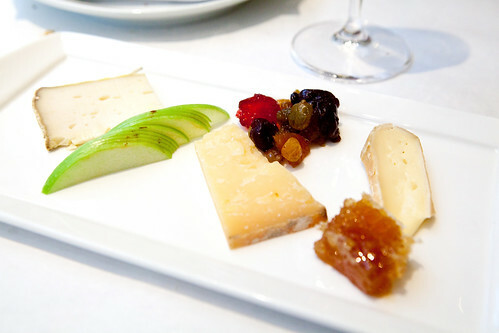 To end this gluttonous meal, we finished with a cheese plate (a duo of semi-soft sheep’s milk cheeses from Spain and a soft cow’s milk cheese from the U.S.) with honeycomb, tart green apple, and fruit chutney and the lemon givré. (I know the grapefruit givré is pastry chef Ghaya Olivera’s signature dessert but it’s a la carte and neither of us could eat any more food.) 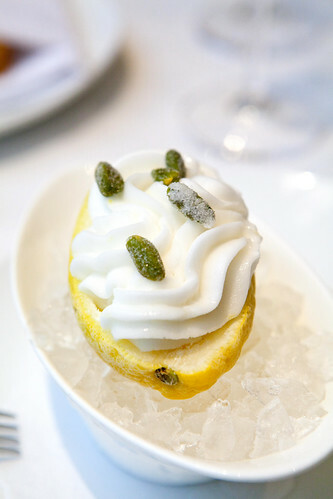 The lemon givré was much appreciated as a dessert for our meal since its limoncello sorbet was not sweet and on the tart spectrum and the candied pistachios gave it a needed crunchy texture. There were a small pair of pignoli crescent cookies on the side and those were buttery and crumbly, in a good way. Overall, this meal was terrific compared to most options around Lincoln Center. It’s different compared to the other dining options around the area. Service was attentive, professional and friendly.